A host of changes were revealed by Ford, when they introduced the 1967 Mustang. Although the original pony car shape that Ford pioneered remained, there were significant styling and some significant performance changes. Major restyling was evident in the new muscular looking sheet metal. in order to make the significantly larger block fit into the engine compartment. 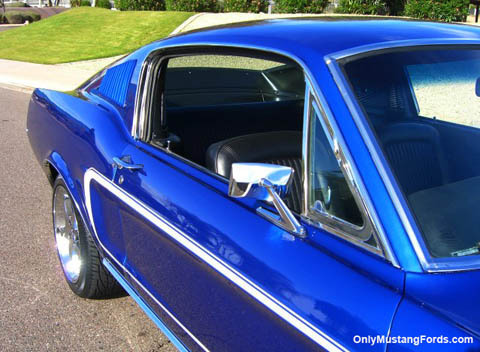 The 1967 Mustang fastback also received a change, with designers bringing the sweeping lines well back and integrating them into the new rear trunk lid. The rear tail light area received a concave look, with three new curve following separated tail lights per side. And color keyed side scoops graced the new body styling. Not as easily seen, was the additional 2.5 inches of increased width and an increase of 2 inches to the length of this new model year. The engine compartment grew to be able to swallow up Ford's new Mustang performance motor. This huge 390 cubic inch, big block motor pumped out 320 horsepower and gobs of torque. 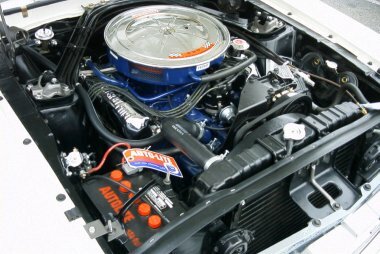 This ground shaker was Ford's answer to the big block Camaro and bragging rights for king of the hill. The other engine choices for 1967 included the 120 horsepower 200 cubic inch inline 6 cylinder engine with a not too impressive 1 barrel carburetor plus three 289 V8 engines. These included a 2 barrel engine producing 200 horsepower, a four barrel engine with 225 horses and the very desireable and now extremely expensive optional high revving "k code" high compression engine which pumped out an impressive 271 horsepower. 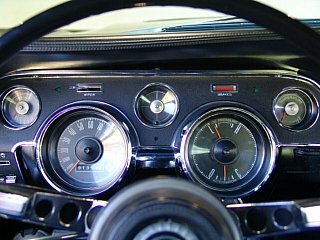 The dash was simplified with round well spread out instruments. A new overhead console was an option and the seat cushions resembled the original 1965 looks. Evidence of the coming government mandated safety measures were evident in the cinnamon bun shaped padded horn button. One of the nicest options available was the continuation of the transmission hump console for both standard and automatic transmissions. 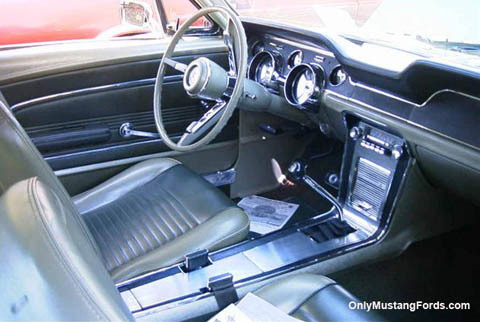 One of the most rare options on the 1967 Mustang was the availability of an overhead console, reminiscent of what one would see in an airplane cockpit. 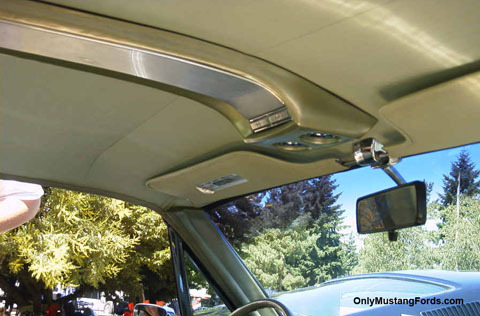 While this option was rare as original equipment, it doesn't have to be in a restoration and many aftermarket reproduction Mustang parts companies have faithfully reproduced these parts, allowing you to add an overhead console to your car, or replace worn or missing pieces on your original console. The fastback was and still is, one of the most popular styles of classic Mustang. It's flowing lines and aggressive look have been a clear favorite of enthusiasts. Here's a link to the 67 Ford Mustang Fastback specs and pictures. Like the earlier cars, Mustang replacement and restoration parts have become much easier to find. Switch to the 67 Mustang Parts section. This is one of the most important Shelby Mustang years of all time. With Ford supplying its own bib block V8 power, Carroll Shelby was not to be outdone and created the awesome GT500. Here are the full details, pictures and specs on the 67 Shelby Mustang GT 500.